Our topic for this Palm Sunday is "Rejoicing and Sorrow." It would be nice if we could turn that title around, and call it "Sorrow and Rejoicing" instead. I suppose we could. Isaiah does. But for the events of Palm Sunday, the progression is definitely from rejoicing to sorrow--not the other way around. Perhaps some people would like it if every sermon focused only on good things, and avoided bad and bothersome things. Some come to church only to be uplifted, not to face the rougher places on life's road. But for us as a church to succumb to that superficially comfortable road would be to miss half of the church's mission. There is an old saying that the mission of the church is to comfort the afflicted . . . and to afflict the comfortable! If we are too comfortable on life's path, perhaps we have stopped traveling that path, and are merely sitting in one place spiritually, making no progress at all. The path that Jesus shows us through his life on earth is full of the most sublime and joyful of high spots and the most dire and depressing low spots. We find in the Gospels no excuse for drifting lightly through life, taking no risks and making no progress. Instead, we find a picture of our Lord as one who lives life fully, walking the extra mile rather than taking things slowly and cautiously. That quality of Jesus' life is present in an especially packed form in the events of Palm Sunday and the week that follows it. Jesus' last week on earth is not only the climax of his life; it is also a microcosm (or smaller version) of it. All the joys and sorrows, the love and faithfulness--and the hatred and betrayal--that swirled through and around his life are pressed down and shaken together into this one week. One week is hardly enough for us even to scratch the surface of the depth and breadth of what happened between Palm Sunday and Easter. Perhaps that is why the Christian church has added the forty-day period of Lent--to give us more time to digest the events of this momentous week. Yet if we do make the emotional effort to comprehend some of the depth and breadth in the events of Holy Week, we find that it is also a microcosm of our own lives. Or more accurately, our lives are a shadow and an echo of the intensity of light and darkness, warmth and cold, of that week. As a church, we could focus only on the "good stuff." We could talk only about peace and love, joy and good deeds. But it wouldn't be a very realistic picture of life, would it? What about all the times we go through that are not so good? What about the times we feel wretched and depressed; when everything has fallen apart around us; when life seems barely worth living? If we looked only at the good parts of spiritual living, and not at the more difficult parts, we would get a one-dimensional picture of what religion is all about. Plus, it would seem just a little bit unrealistic--especially when things are not all sweetness and light for us. So we will stay with the topic of "Rejoicing and Sorrow" this morning, and see if we can touch some of the realities of our lives as pictured in the events of Palm Sunday. The story certainly begins on a note of rejoicing. After sending two of his disciples to procure a colt for him, Jesus rides into Jerusalem surrounded by a throng of people joyfully shouting out hosannas to the king who comes in the name of the Lord. The Gospel of Luke mentions people placing their cloaks on the colt and on the path in front of Jesus. For such a great one even to ride over their clothing was a great honor! The Gospel of John adds that the people took palm branches with them when they went to meet Jesus as he rode into Jerusalem. This is where the name "Palm Sunday" comes from. As Swedenborg mentions in our reading from Apocalypse Explained, palm branches hold a meaning of heartfelt joy and celebration. Our Procession of Palms here in church captures some of that spirit of celebration for us. We, too, can feel the joy and celebration when the Lord comes into our lives. When we realize that we are not alone; that there is a loving, personal God who cares for us very deeply; when we realize that our lives have a meaning and purpose that we may not even be aware of, but which is held for each of us in the Lord's heart; when we realize these things, we can feel rejoicing and celebration in the wonderful richness of life that the Lord offers to each one of us, whatever our outward circumstances may be. It is a wonderful feeling--especially when we have been through difficult circumstances. It is wonderful to know, not just in our heads, but in our hearts, that there is more to life than a struggle for existence. It is wonderful to know that the Lord, the infinite God of the universe, cares for us enough to enter into the life of each one of us, giving a deeper, spiritual dimension to all of our experiences here on earth. It is wonderful to know that our life here is leading somewhere--leading to a heavenly community of mutual love, respect, and service to each other and to the Lord. Once again, it might be nice if we could keep ourselves in this aura of celebration and rejoicing. But once again, that is not how life works. In the events of Palm Sunday, the contrast is especially stark. As Jesus approaches Jerusalem, with the people shouting out their praises and joy, what is the very first thing he does? Does he add his voice to the cheers of the crowd? No. The first thing Jesus does is weep over the city. Perhaps Jesus' sorrow is heightened by the great contrast with the happy hubbub going on around him. Contrasts can be devastating--and the contrast between rejoicing and sorrow that Jesus saw around him and before him moved him to tears. He saw a happy crowd crying out peace and glory to the highest heaven . . . and an entire city that could not see or experience that peace because of the hardness of its people's hearts. Isn't this the difficult contrast for us as well? When we catch a glimpse of the golden vision of life that the Lord offers us, and then see how far away from that vision much of our life is, both as individuals and as a culture? How can we hold such contrasts in our minds and hearts without feeling, not only joy at the Lord's coming into our lives, but also intense sorrow? We see the wonderful ideals of doing unto others what we would have them do to us; of loving our neighbors as much as we love ourselves; of taking care of each other in our sorrows, and rejoicing with each other in our joys. Yes, we do experience each of these things in the course of our lives. But we also experience times when people's actions are full of anything but love and concern for each other. We see all too many examples of this in the news. If we are not too hardened to the daily stream of it, these sad stories give us pain. Yet if we are honest with ourselves, we also see times when we ourselves did not act out of love and concern for others; when turned our back on someone who needed us; when we were unwilling to forgive someone, or said or did something that hurt another person. Yes, the contrasts between rejoicing and sorrow are present in each of our lives as well as in the news of our community and our world. To an often frightening degree, we are a microcosm--a small version--of our community and our society. When we point our finger at terrible people out there doing terrible things, all too often, if we search deeply within ourselves, we find that the spirit of those acts is present in our own soul too--even if we have not expressed it the same way. Palm Sunday presents us with both rejoicing and sorrow. It presents us with the joy of the Lord's renewed entry into the spiritual center of our lives. It also presents us with the sorrow of recognizing all the wrong things that have been at the center of our lives instead of the Lord up to this point. In this contrast, there is also a challenge. It is the same challenge that is presented to us in our reading from Isaiah. Now that the Lord is approaching our spiritual Jerusalem to enter into the heart of our lives, whom will we enthrone there? Will we stay with our old ways that eventually bring us to sorrow? Or will we awake, and let the strength of the Lord's arm sweep away all that does not belong to love and rejoicing, just as the Jesus' arm swept away those who bought and sold in the Temple? If we are willing to let the Lord reign in our hearts, then we will indeed turn around this morning's topic. Then, as the prophet Isaiah says, we "shall obtain joy and gladness, and sorrow and sighing shall flee away." Amen. 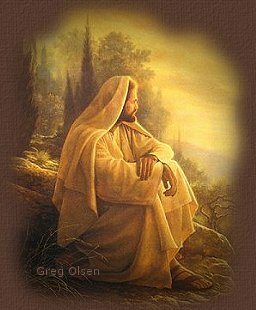 by artist Greg Olsen and used with his permission.